It seems that this short run of Xombi is a continuation of a series first published in the 90s. And I think that somebody who had read the original Xombi would have gotten more out of this than I did. It was definitely written for an audience of returning fans, with references that I just couldn't understand. What I was able to follow was gloriously weird and inventive. A lot of comparisons to Morrison's Doom Patrol have been thrown around, and they're apt. There's a similar level of weirdness across the board, and the characters tend to take it all in stride. But I do wish that I had read the 90s Xombi, because this volume presumes that you already know and are attached to the main character. The writer doesn't work for it, which left me feeling indifferent towards him, and not particularly upset that this title is finished. This book was such a waste of paper, I quite honestly don't know why I even finished it. An impressive bit of crazy weirdness that's like Doom Patrol at its best. The sheer imaginative power of this comic is stunning, but even better, it manages to create a cohesive and believable weird world. I'll admit being a bit off-put at the start, when it really felt like I was thrown into the middle of things, but by the end I was loving this imaginative excursion and wanting to see more.The art is also tremendously good and moody.Overall, this could have been a brilliant series if it hadn't been sacrificed on the alter of the New 52, like so much else. As is, it's just a one-volume appendix: not truly enough to love in a serial, IMO. There's something about the way this was written that kept making me think it wasn't the first collection of stories for this character/world. The characters kept mentioning past situations and people in a familiar way. And I'm still not sure if there were previous issues or not. But, I was sold on the story when I found out that there were pun-named fighting nuns (Nun the Less, Nun of the Above, Nun the Wiser). The story of one man rendered indestructible by nanotechnology, and the weirdness he encounters - at its best, Xombi feels like it could be a spin-off from Grant Morrison's Doom Patrol, in particular the Willoughby Kipling issues. Elsewhere, the plot and message can get a little conventional, especially in the more overt 'But what does it really mean to be...human?' wibbles. But, even then Frazer Irving enlivens it all with his usual ghoulish verve. I loved this mini-series and wish it had sold well enough to continue or at least see a collection of the original Xombi series from the 90s.Wonderfully strange and inventive, full of fantastic ideas that may or may not be explained, this is one of my favorite comics from a mainstream publisher. When the New 52 was first announced, I was extremely excited--because I thought this was essentially 52 chances to experiment. Instead, the vast majority of the books were stale, date and unambitious, imo. The few things they got right were Batman, Animal Man, Swamp Thing and Wonder Woman (Kind of). Grant Morrison's Action Comics was kind of a flub. And then the rest of the titles? The only things memorable were Grayson, Midnighter, Prez and....Xombi. The blast of weirdness I was expecting was not the case. But rather heavily branded and corporately incubated projects. Few titles were allowed to have their Freak Flags Fly, and even Morrison's Superman seemed moderately subdued. Xombi is the one book that had that Doom Patrol-level weirdness. It was fun, had great art and so many ideas; like good innovative comics should. In this book, David Kim is a Xombi, a person “infected” with nanomachines that repair his body very quickly when it is injured. They are so fast and efficient, he can survive even horrific traumas, such as loosing an arm. In the normal course of David’s life, they repair the consequences of normal aging, so he is in essence close to immortal.In this story involving a major battle between good and evil, David is allied with several others with extraordinary powers. Nun the Less is capable of shrinking when desired and wears the complete nun outfit including the white collar and black hat. She is always packing a gun with bullets effective against the evil powers. Catholic Girl is dressed in a Catholic school uniform and is capable of flight and powerful energy discharges. Nun of the Above is also dressed in the classic nun attire and carries a weapon that looks very much like a light saber.There are other religious references in the graphic novel, one of the powerful creatures that David battles is called Maranatha and another person that David is allied with looks like an old style religious scholar with the full beard, robes and headgear.The battle involves the movements of floating fortresses accessed via secret passages, ingestable pearls of wisdom and besting gangs of powerful and dangerous creatures. Other puns are used in this very imaginative story in graphic novel form. Whether you like the story or not, you will be impressed with the quantity of imagination expressed within it. This has been in my "to read" queue for some time, and it's not exactly what I expected. It's a weird, strange, science fiction tale that involves (as far as I can tell) nanotechnology, immortality, and a futuristic society handling all those issues. In that it can't really decide fully what story it's trying to tell, I confess to not enjoying it as much as I wanted. With that said, it is a pretty cool story of ideas and such combined with some good artwork to push it along.Not great, not bad at all, though. If you're looking for something different, it might be worth a look. A wonderful book that lies in the nether region between the (old) DC Universe and Vertigo and is on a par with Azzarello and Chang's great Doctor Thirteen: Architecture and Mortality of a few years ago, Spenser's Jimmy Olsen backup, or some of Morrison's more accessible stuff like Batman and Robin (which artist Fraser Irving worked on) or All-Star Superman. Nice to see the old Milestone properties given a workout. Extraordinary flights of imagination (the husk monsters made of the ghosts of wasps trapped inside windows alone, wow), but sometimes stiff narration and prose. A clunky tendency to explain David Kim's emotions instead of finding actions that will express them. 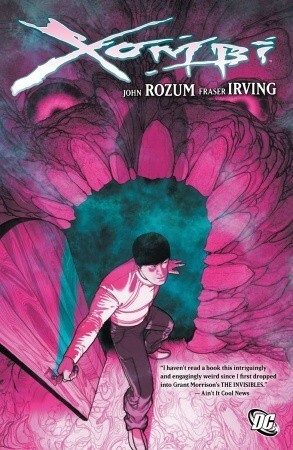 Promising enough that I'll keep an eye out for Rozum's work.Frazer Irving does amazing things with color. More creative and fun than most any other comic out there put out by the big two. This probably won't make sense to anyone else, but there's a lot here that reminds me of the Shonen Manga One Piece. Yes, this is more horror based and more overtly meant for adults. But they both take a crazy concept and not only make it crazier, but put it together in a way that works. Lots and lots of fun. The art was decent, but didn't move me. Xombi was not that interesting of a character. I did enjoy the nuns and the glowing flying Catholic girl. Oooo and the main who trapped souls in coins that talked to him. The strongholds and the bad guy wasn't that entertaining to me. There is more creativity in the dot of the I in the logo of XOMBI than there is in 99% of comics and graphic novels on the market today. Rozum and Irving are perfectly teamed here for an engaging, amazing, new-reader friendly book. This was fresh and interesting adventure, probably better suited for DC's Vertigo line. I liked the characters, but it felt a little clunky trying to push all the backstory into this volume rather than organic. Art is kind of gorgeous. It took several attempts to get into this, but when the right mood struck me, it was a great story. It had a nice balance of seriousness and tongue in cheek humor, a world full of possibilities, and a fun cast of characters. More, please! Despite a few stunning images, this was unfathomably unbelievable. People's facial expressions were outlandish. The story was pointless. The storytelling was exposition hell. I forced myself to finish because I had a sudden bout of stubbornness. Some dig it, that's great, not me. Really neat and weird stuff. The art is fantastic and consistent. The story is loaded with bizarre ideas and characters. A wild and imaginative story with absolutely gorgeous artwork from Frazier Irving!More! Please give us More! I can see why Drew liked it. Morrison-like but with characters instead of archetypes and plots instead of excuses to babble bullet points at you. Great art as well. Kind of upsetting we didn't get more from this series. This book is fantastic. Great moody art by Frasier Irving. Fantastic weird stories reminiscent of early Grant Morrison. Deep, rich, dramatic story-telling. Good characterization. The universe of this world, I wish was larger, but I seemed to "key" in immediately. This book is "fawseome."